This had been my little garden shed for a few years. 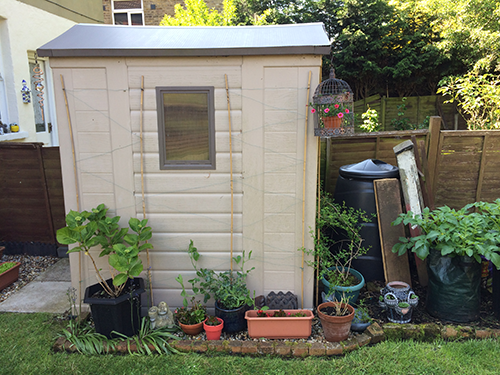 At 4′ x 5′ it was the perfect size to fit the existing foundations of the previous shed and big enough/cheap enough to hold all the usual gardening/decorating stuff. However, due to me regularly taking over the kitchen table to do my craft work (and damaging the table slightly – eek!) plus taking over the limited storage space in our flat with my crafting tools and other paraphernalia, we decided it was time to get a new, slightly larger shed that I could use as a crafting space and for storage. Yay! We set to work on dismantling the old shed, only to discover that the shed had been holding up the neighbour’s fence! 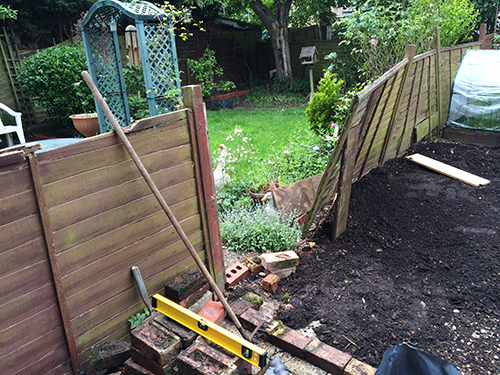 We removed the collapsing fence panels and thankfully the neighbour’s landlord did eventually repair the fence. 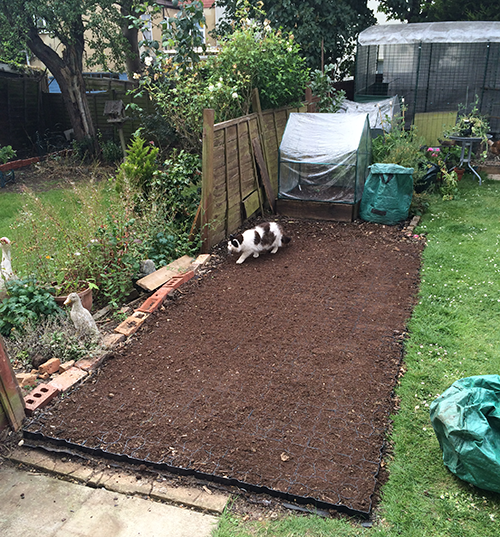 As the new shed was going to be bigger (approx 5′ x 11′) we needed to extend the base. After reviewing our options it seemed that the simplest solution was to use an interlocking plastic shed base system. We calculated how many we needed, ordered a few extra, and they arrived a couple of days later. The first job was to level the ground using a rake. Its worth taking time over this and walking over the ground to make sure it is compact. Then once this was done we laid weed control fabric on to the soil. We measured and marked out exactly where we wanted the shed to be positioned and then lay down the grid squares before interlocking them together. Using some of the ballast we had removed at the levelling stage we filled the grids to create a solid base. This method was so much easier and quicker to lay than concrete and it does mean it can be easily removed at any time in the future, plus the results were great. The next step was to order the shed. Having researched many, many shed companies, during the previous weeks, we finally opted for a local business that would build you a bespoke shed exactly as needed. Perfect! We met with the company, discussed our requirements and placed our order. The only downside is the 6-8 week wait…noooooo. I guess that is the price you sometimes pay for using a small family business with a strong reputation. Oh well, for the next couple of months I will just need to be very patient. At least the cats can enjoy the short-cut into next door’s garden lol.